Michael Mann's Ali is apparently a good film for some people. But it's not for me. I suppose most fans of the movie are amongst the fans of Muhammad Ali / Cassius Clay. The usual reason for such appreciation is fans of a particular person or topic are more inclined to like stories about that person or subject. But in this case there is something more: director Michael Mann has chosen to tell the story of Ali in a way only people which have enough knowledge about the boxing legend are able to comprehend and appreciate his movie. Why Mann has chosen to make the film like that is beyond my understanding. What I know is I generally enjoy movies about men like Muhammad Ali but gathering a bunch of random facts about someone and basing otherwise unrelated cinematic sequences on these facts is one of the least successful ways to entertain me. 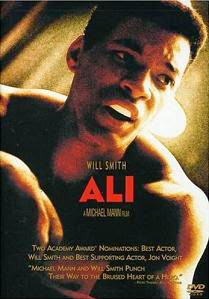 As expected, Ali is a biographical film about sports legend Muhammad Ali. Various moments from his early life and career are displayed and even a completely unfamiliar spectator will understand that Ali has been a great boxing champion and a very interesting man. The problem is it's hard to understand anything more substantial from the movie. There are plenty of Cassius Clay's life aspects referred in Ali, being either his boxing success or his religious life or his years in "disgrace" or his trip to Africa. But everything is treated in a way if it is told to people who already know Ali quite well. It is a strange approach to tell a story, especially of someone whose glory days have been a couple of decades in the past. The movie is not void of good acting. Will Smith as Cassius Clay / Muhammad Ali and Jon Voight as Howard Cosell are particularly notable but the rest of the cast deserves good words too. There are also a few enjoyable cinematographic moments thanks to cinematographer Emmanuel Lubezki. And there could have been an interesting screenplay. But in reality the writing is not good. The lack of a coherent story makes the film very diluted. "Creative" ideas like following Muhammad Ali's "running" in Africa for a good number of minutes doesn't help either. The dilution of the material is so strong there are some presumably important characters in the film, which the unfamiliar spectator will still stay unfamiliar with until the very end of the movie. It's hard to follow the narrative because there is hardly any narrative to be followed. Saying all of the above, I can see why there are people who vastly enjoy Ali. If you've been a fan of his through the years and you know a lot about him, it should be really cool to watch sequences reminding of events you've personally experienced or you have read about in your earlier life. I suppose it is comparable to the experience of seeing a series of brief moments of your own life (like on a film tape) in an existence-threatening situation with the difference the life is not yours in this case. But for others, not having a decent knowledge of the legend, watching the movie is more of a painful adventure than a pleasant trip. And just in case, you can always watch Spring Breakers if you want to feel better about Ali. I do really enjoy that kind of not so standard funny stories although I'm aware not everybody likes them. Anyway, have fun with the ones below. Three wanna-be heroes decided to fight with an almighty dragon in a cave. The first man went into the cave armed with the latest generation of weaponry. He began throwing powerful bombs at the monster while shooting with the most modern machine gun. The dragon looked at the guy apathetically, hit him with its big tail and instantly killed him. Then the second guy, a mighty wizard, went into the cave swinging his magic sword and casting omnipotent spells. The dragon looked briefly at him, hit him with its tail and slew the wizard with ease. The time for the last hero to face the monster came. He entered the cavern with a plain club, saw the bored dragon and raised the club ready to fight. The dragon yawned for a moment, then knocked the simple man down with its tail wiping him out in a tick. Three wanna-be heroes decided to fight with an almighty dragon in a cave. The first man went into the cave armed with the latest generation of weaponry. He began throwing powerful bombs at the dragon and killed it. A cow was clambering up a tree. An ant saw the cow and asked in astonishment, "Why are you climbing that tree?" The cow looked down and replied, "I want to treat myself to a couple of apples." "But this is an oak," even more surprised, the ant said. "Don't worry," the cow retorted with annoyance, "I'm bringing a few along." A dolphin met a cow swimming in the ocean. The dolphin asked, "Where are you off to?" "I'm heading for the North Pole," the cow replied. The dolphin looked around and said, "But you are moving south!" "Well, it doesn't matter," the cow mumbled, "I'm going to sink in a second anyway." An advertisement in a newspaper: 27-year-old, handsome, tall, well-built, of friendly temper and with good sense of humor, financially stable man wants to buy a farm wagon. Naked Snow White was lying on a boulder in the forest. A dwarf saw her and told her, "Snow White, as I'm looking at you lying there, I'm tempted to come and do something bad with you." Snow White seductively said, "Okay, that's what I'm waiting for." Upon hearing it, the dwarf did not hesitate anymore. He went to Snow White and broke her leg. An engineer and a software developer were flying in a plane. The engineer was sleeping but the software developer was wondering what to do. Finally he poked the engineer with his elbow and said, "Do you want to play Questions and Answers? We are going to ask questions and whoever is unable to answer will give 5 dollars to the other." The engineer opened his eyes and yawned for a second after which he continued to sleep. To talk the engineer more easily into his idea, the software developer suggested, "Okay then, if you cannot answer, you will give me 5 dollars. If I can't answer though, I will give you 50 bucks." The engineer reluctantly agreed and the software developer asked, "What is the distance between the Earth and the Moon?" The engineer silently gave him 5 bucks. The software developer took them and said, "Now, it's your turn." The engineer asked, "Who climbs a mountain on three legs but goes down on four?" The software engineer was shocked. He opened his laptop, searched the Internet, used his mobile, sent emails to his friends but he was not able to find the answer. Finally, he took out 50 dollars and handed them to the engineer with the words, "Okay, I'm paying. Now, tell me the answer!" The engineer silently handed him 5 bucks, closed his eyes and continued with his sleep.